The current proposal aims at bridging the two Science Areas which serve as a framework in the definition of Science Requirements for the SWOT mission, namely hydrology and oceanography. We wish to examine some of the important hydrodynamical processes which connect them. We believe that the SWOT mission has the dual potential to make unprecedented progress at (1) monitoring the river-to-ocean continuum and (2) improving estimates of the processes at work. The incentives for this proposal are properly expressed in the white paper which was prepared prior to this call (Ayoub et al., 2015): in particular, we make ours the idea and suggestion that "the regional ocean/shelf/continent should be considered as a continuum, and we suggest that numerical methods and data processing tools that exploit SWOT observations should be developed with this continuum in mind." This project is not equally balanced between hydrology and oceanography. It revolves mainly around the ocean shelves and associated processes with small-scale signature (plumes, fronts, internal waves, tides, shelf mesoscale, etc. ), and on their neighboring transition zones, namely estuaries towards rivers, and shelf slope towards the deep ocean. We are interested in working in several sites which include shelf areas and lower estuaries, and in comparing our findings with several teams worldwide studying similar or alternate sites. For instance, connections have been set with the proposal of Laignel et al. : "Characterization, Modelling and SWOT Capacities to Measure Hydro-Meteo-Ocean Phenomena in Coastal and Estuaries Systems". Finally, let us stress that this proposal is interested in lower estuaries only insofar as they condition river mouth and plume dynamics. Objective 1: Advance our understanding of fine-scale dynamical processes (O(1km) to O(10km)) within the estuary-mouth-plume-shelf-break-ocean continuum. Objective 2: Identify the signature of these processes in current and future measurements, in particular Sea-Surface height (SSH) and other surface measurements. Objective 3: Characterize the potential impact of future SWOT measurements, together with complementary in situ measurements, on the estimation of those processes. We propose to study two regions with geographical similarities (presence of an estuary/delta, wide shelf, macro- tidal dynamics) yet sufficiently different (mainly tropical vs. mid-latitude site, estuary vs. delta) to provide a wide spectrum of physical processes and to open new perspectives for SWOT applications. The two sites are the Bay of Biscay in the North East Atlantic with the Gironde estuary and the Gulf of Tonkin in the South China Sea with the Red River delta (Figgure 1). Figure 1. Left: Bay of Biscay GEBCO bathymetry basemap (source: http://portal.emodnet-bathymetry.eu). Right: South China Sea bathymetry (Source: Wikimedia Commons). The Bay of Biscay circulation is primarily constrained by its specific bathymetric features (Figure 1): a narrow continental shelf along the northern Iberian coast, a shelf with an increasing width towards the north (about 300 km at 47°N) opening to the English Channel and to the Celtic Sea, and an abyssal plain with typical depths of ~4500 m. The Gironde estuary is formed by the influence of the Garonne and Dordogne rivers. It shows a regular funnel shape; its width increases seaward from the head of tides, located at 165 km from the mouth. At its maximum width, the estuary is 12 km wide at high tide. The mean average combined river discharge of the Garonne and Dordogne rivers is about 700-800 m**3/s with a well-defined flood season from November to May (instantaneous flow values up to 3000 m**3/s, and a low flow period, from June to October <200m**3/s) (Castaing and Allen 1981). Because of the interactions of physical processes at multiple scales, it is only by improving our knowledge of the general functioning of the circulation together at regional and small scales over the shelf and in the nearshore area that we will be able to provide estimates and predictions useful for economical and societal applications. Gulf of Tonkin (GoT) is a shallow region (<60m) subjected to large sediment inputs that result in a strong biological activity. It receives freshwater from the Red River, whose discharge (in average 3700 m3.s; Le et al., 2007), shows a strong seasonal variability related to the Southeast Asia monsoon regime (Wyrtki, 1961), with a 10 factor between the wet (June-October) and dry (November-May) seasons. The Red River transports 40 Mt/year sediments, 96% during the wet season (van Maren et al., 2004; Le et al., 2007). Tides influence the functioning of the GoT, with a diurnal regime and a tidal amplitude larger than 2m (Fang et al. 1999). GoT is also subjected to the impact of human activity over the Red River delta (Hanoi, 6,2 M hab; Haiphong, 2M hab): pollution, dams, etc. A detailed study of the tidal propagation around and within the delta has major consequences to improve the water basin management, in the context of programmed dam impoundments. Finally, the landscape of GoT coasts is relatively flat, the question of the variability and evolution of sea surface height in this region is consequently a very important issue. Topic 1: Lower estuary dynamics: impact of tides on salinity; 2D versus 3D surface signature (sea level) of estuarine dynamical processes. Topic 2: Estuary to shelf transition zone: plume dynamics; interactions between plume, tides and wind induced circulation; signature of the plume on SSH. Topic 3: Small-scale processes over the shelf: characteristics of the mesoscale over the shelf; signature of mesoscale patterns and mid-shelf seasonal fronts in SSH. Topic 4: Shelf break processes: slope current and internal tides: seasonal variability, propagation and signature in SSH. Topic 5: Multiscale estimation approaches: nature of small-scale/high-frequency model uncertainties on the shelf; multiscale data assimilation of sea surface elevation and SST. Analyze the link between modeled SSH patterns and the 3D circulation structures so to identify the signature of the dynamical processes on sea level signals. Generate SWOT-like pseudo observations from the SWOT ocean simulator of JPL and the simulations to better understand the observability of the coastal processes in the future SWOT data given the space-time sampling and the data errors. Study the impact of SWOT data by constraining our model with SWOT-like pseudo observations. We explore strategies aimed at modeling the coastal continuum, from the regional ocean (including the abyssal plain) to the lower estuary. We focus on the areas mainly influenced by the tidal dynamics; to this respect, our project does not include the beach and swash zones dynamics, which is primarily driven by surface gravity waves. In situ and satellite observations, even with a coarser resolution or a different spatial coverage than SWOT observation, will be explored to better understand small scale processes and complement the numerical modelling analysis. In particular, nadir altimetry from Jason and Sentinel missions will be used. Figure 2: Singularity exponents computed from Modis Chl concentration data (28/03/2012), from Yelecki et al., CSR, 2017. Figure 2 illustrates some work in progress based on satellite observations aiming at characterizing small-scales over the Bay of Biscay abyssal plain and shelf. The modeling strategy is based on three codes and on several configurations, that allow us to explore different issues and compare different numerical approaches. The TUGOm 2D and 3D spectral unstructured-grid models, developed at LEGOS, Toulouse, for the barotropic and internal tides studies. 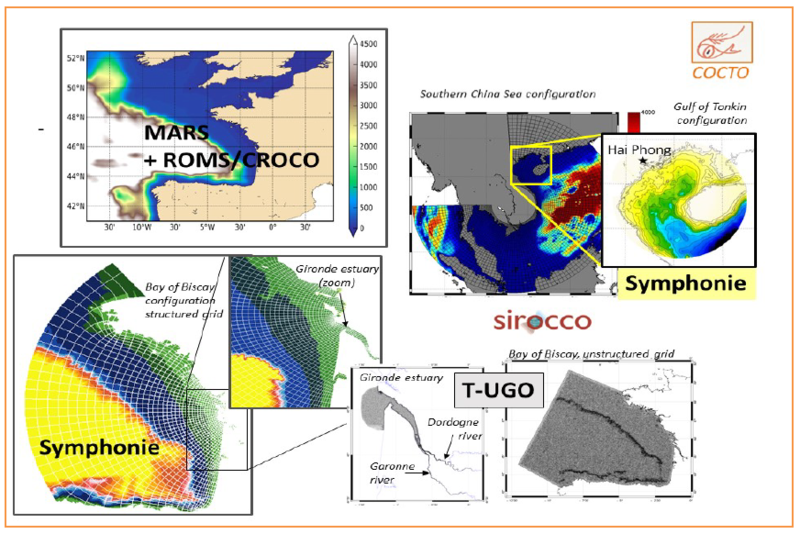 The SYMPHONIE structured-grid coastal circulation model developed at Laboratoire d'Aérologie (Toulouse). 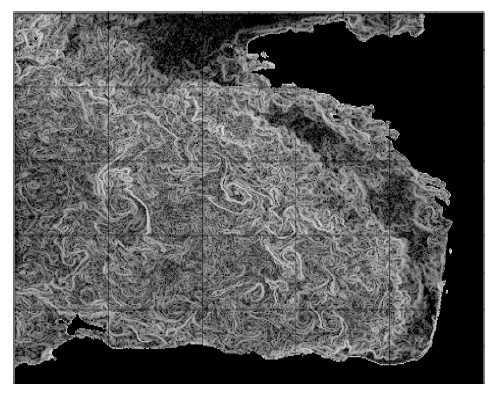 The MARS3D structured-grid coastal circulation model of IFREMER, now being replaced by ROMS/CROCO. The SEQUOIA data assimilation platform with the EnKF kernel, developed at LEGOS. To study the coastal continuum from regional/deep ocean to estuaries, and the inherent downscaling/upscaling issues, we explore with the Symphonie code the use of horizontal grids with variable mesh sizes. Figure 3. Models and configurations used in the COCTO project. The Gironde estuary configuration with the TUGO model is run in collaboration with L. Chevalier and B. Laignel (Univ. of Rouen). On the better understanding of the processes ruling the coastal continuum in both regions of study (Bay of Biscay/Gironde estuary and Gulf of Tonkin/Red River delta). The targeted processes require expertise of several dynamical fields: river flow, tides, fine-scale of the circulation due to frontal jets, density fronts and baroclinic instabilities, surface gravity waves impact on the circulation. Collaboration with external groups on these topics will be built or reinforced. In parallel, our modelling strategy from the estuary to the shelf edge constitutes an innovative approach and we expect significant progress made on the understanding of the physical processes. On methodological expertise and technical know-how on the fields of numerical modelling and data assimilation. In particular, we plan to propose strategies and configurations tailored to help the interpretation of SWOT observations and complement the analysis of SWOT data in several other efforts made for separating and filtering high-frequency signals from the circulation, for combination with other remote sensed or in situ observations, for mapping and reconstruction, for data assimilation and forecasting activities. We are also fully aware of the wide potential of SWOT applications in terms of ecological, societal and economy- related issues and activities in the coastal and nearshore ocean. Therefore, we will care about seeking opportunities to develop or transfer our expertise or tools towards academic or industrial partners involved into applied developments and valorization.